Manga Gossips - Secrets of Manga Artists Exposed! 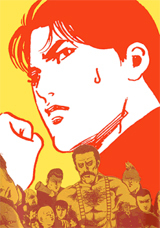 The world of mangaka often produce fascinating stories. Some of them simply an interesting read, while others outright impossible. Some of these stories are true, while others are rumors that found their way into internet bulletin boards and became "real." All the hot gossip here! - Secrets of the comic book artists exposed! You are a comic book fan; you passionately love comics and see them as food for your soul. And just as you love comic books, you love their creators; you love them as much as your own parents and marvel at how they could have the energy and imagination to continue time after time to create such magic. The image of them in your mind is dazzling and heroic. At some point, however, the thought may have occurred to you 'comic book creators are real people too; beneath the veneer of fame, their lives share the same realities as ours.' Sometimes such an idea can come as a shock to you! It is these stories behind the storytellers that we will call 'gossip' here. So what is the gossip on their lives? Do you dare join us in digging up their secrets? From this point it's going to get unflattering for some comic creators. Behind the scenes! The unspeakable secrets! At one time Osamu Tezuka, a figure in comic books revered by countless people, led a double life. By the light of day he was a doctor and in secret he was a comic book artist, which as a fact alone is incredible. What is more incredible, however, is how some people he worked with assisted him in leading his double life. His editor, for example, would collect Tezuka's drafts by visiting him at the clinic pretending to be a patient. The two would put on a completely convincing act of a medical consultation, while Tezuka would discretely hand over his original drafts (are you secret agents?...). When he started getting more and more busy with his comic book work, he would also ask a nurse to rub out pencil lines or to model for him, etc. At the risk of being discovered at work, Tezuka would lock the door most of time, which resulted in shameful rumors circulating the hospital that he and the nurse were having an affair... this precarious, guerrilla lifestyle continued until Tezuka officially left the medical profession. These experiences were later recounted in his autobiographical work "Paper Fortress". 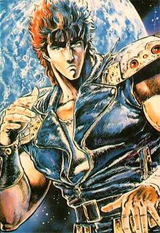 After reading the voraciously received strong-man classic "Fist of the Northern Star," many readers will sooner or later start to speculate whether writer Tetsuo Hara is like the formidable, steely characters he writes about. At this point, it is our duty to inform everyone that HE IS! It is said Hara worked so hard that he would strain his eyes, and would have to resort to drawing with only one eye open at a time; in spite of this, the quality of his work has never once suffered! Such dedication is awe-inspiring! What's more, they say Hara once received an eye patch from a fan as a birthday present, which goes to show his fans not only paying homage to his great achievements but also sharing a certain dark sense of humor. Creator of the dryly humored series "Cromartie High School", Eiji Nonaka's style of art bears much resemblance to the work of Ryoichi Ikegami (if you think about it, the scene of a crowd of delinquent high school students run amok is, I think, one infinitely scarier than a fight for sure); because of this, he received a lot criticism and accusations of plagiarism and imitation. Ikegami himself, however, didn't mind, although apparently when some readers asked Nonaka to sign some of Ikegami's work he may have been a tad nonplussed. Reasons for getting into comics! For some was it for the stars and the ocean? Creator of "Dragon Ball", Akira Toriyama was originally working a regular job, but the major commute drove him into making comic books instead ("Because it's closer" ... Wow, this guy's brains are not unlike "Slam Dunk"'s Kaeda Rukawa). Although he once worked a 9 to 5 job, he was always lazy at heart; it is said that the reason he created the Saiyans was because "the hair is easier to color!" The reason Frieza changes form countless times: "I was trying to make him detailed but easy to draw!" Why the surrounding city or landscape always gets obliterated so easily: it saves the trouble of having to draw any background (...), he was lazy to the point that not one drop of rain fell in his stories until he had gathered a bunch of old women to draw in rain lines for him... Bear this in mind, and it comes as no surprise that he no longer makes comics, preferring to simply live comfortably off of his royalties. His parents were extremely careless people; the times they didn't have enough money to buy food they would go dancing to forget their hunger (... which to me sounds like they were more irresponsible than careless! ), and Toriyama chose to draw comics to forget his growling stomach (comforting himself with illusions... harsh). A family background such as his must have contributed in some way to his ability to create so many neurotic characters. Mazakazu Katsura's motives for entering the Tezuka award were to spend the prize money on a stereo (confidently thinking he had a chance of winning), although by the time he finally won and got the prize money he had already saved enough money and had bought the stereo (so he must have been rejected several times...). Although Katsura's work is very popular due to the many "indecent" scenes, many of his younger readers have to buy and read them discreetly (.. and who could blame them...). 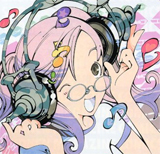 Author of "Tenjho Tenge" and "Air Gear", Oh! Great (Ogure Ito) enjoys a reputation for his consummate skill at drawing; however, this man's real reasons for entering the world of comics was to pay back his debts from playing pachinko (... A gambler! Don't copy his mistakes!). Bad Karma! Our goal is to become the public enemy! Tatsuya Egawa, author of "Tokyo University Story" and "Russo-Japanese War Story", once criticized "Doraemon" and other titles of having low morals, while releasing "Mad?? Tenshi Unpoko", a title of his own that imitated "Doraemon" (shameless!). He also once bemoaned the importance attached to school records in Japanese society; around the same time, he was illustrating exam textbook covers (has he heard of the term sell-out?!). He also once announced that his young assistants had no sense of responsibility and that he would be more productive without them, while relentlessly hiring people to help him (this kind of person will sooner or later find his assistants ganging up on him...). None of this has been more infuriating than when he went around driving a 6-million-yen Mercedes Benz SLK, while at the same time professing that he bought this model because he didn't really understand cars... which is just trying to show off. Another comic book creator with a knack for offending his contemporaries is Koji Kumeta, of "Sayonara, Zetsubou-Sensei" fame. As well as using his work to discuss social issues, he enjoys parodying other comic book artist styles, having written "Katte ni Kaizo" before he felt confident enough to take on his contemporaries and wasn't afraid of any unsavory consequences. What is funny is that the times he is fully aware that he will face repercussions for his writing he attaches the disclaimer "If my material isn't in the top three most popular in the space of five weeks then I won't draw anymore." The result is just as he'd hoped (but what if he really had to give up!?). Veteran Baseball comic writer Shinji Mizushima has always had an energetic, sweaty style; because of this, he's very scornful of Adachi's baseball comics, which are a fusion of romantic and coming-of-age themes. This scorn of his translates into hostility to Adachi's fans (I admit here I am an Adachi fan!). 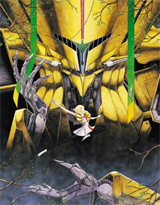 Another artist who is happy to offend other people on account of someone else is Masami Kurumada; once, his demands for the series "Saint Seiya" were so stringent, he suggested replacing many of the voice actors and people working behind the scenes, which aroused a lot of resentment from his team and his fans... looks like Kurumada's attitude befits a manga writer. The unfathomable! Alternative hobbies and dreams! 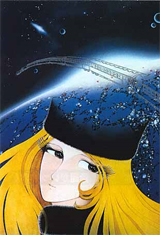 Leiji Matsumoto, creator of "Galaxy Express 999", is known to be rather mischievous; he once gave Tetsuya Chiba, author of "Tomorrow's Joe", shiitake mushrooms to eat, which he had grown in his underwear (gross... if you think about it, how dirty must his underwear have been to cultivate mushrooms in them! I'd also like to know what would Matsumoto do if something were to happen to Chiba as a result...). Following this drama, it was the great Tezuka who delivered sweet retribution, by taking chocolate and adding it to a bowl of Udon Noodles, which he gave to Matsumoto to eat; an eye for an eye (suddenly I feel that these older generation mangaka never grew up...). Manga queen Rumiko Takahashi loves to have very long, drawn out phone conversations, her record time being 12 hours (half a day?! Even if I could afford to I don't think I could last that long!). She can bend her thumb at a right angle, a favorite party trick she's always more than happy to show off, leaving people speechless (What's so great about that?! Why would that be considered anything special?!). Kozue Amano, creator of "Aria", is more worthy of our respect though as her special talent is to sleep standing up (... Is she a horse? Or an Elephant?...). "Fullmetal Alchemist" creator Hiromu Arakawa's family runs a ranch, and she grew up with cows for company. She was born in the year of the cow and is a Taurus (amazing set of coincidences), so her avatar is always a cow's head. When asked about her dreams, she always has the same reply: to open a ranch on the moon (her only dreams are pipe dreams...). The eagerly awaited titles! The trio of deadline draggers! Togashi is also the devoted husband of Naoko Takeuchi. When Takeuchi once expressed praise for "Elfen Lied", Togashi immediately inserted more brutal scenes in spades to cater to her fancies... I wonder whether he'll be as actively concerned about his own reader's desires (sob). It's time to draw the curtain on this vigorous gossip. Having just read all of the above, I'm guessing most of you will be thinking "Is it all really true?" and I can't honestly say I know, but nevertheless, it's funny. Does it matter whether its true or false? Where gossip is concerned, there's rumor to reality and reality to rumor. Only when the line between the two is blurred, does the world become more intriguing... (stage exit, off to eat an omelet). Submitted by Dylan Acres (not verified) on Wed, 2009-02-25 15:40. This was an excellent article! Really funny! Thanks for sharing this, and I can say that the Takahashi rumors are definitely true! Submitted by AKhan (not verified) on Sun, 2009-04-19 16:03. Very amusing and informative article, kudos. I really hope you can keep getting the chance to write more like this. Submitted by AnthonyOL (not verified) on Mon, 2009-07-13 09:08. It's been fun reading this piece, indeed. Thanks for the translation, and I'm looking forward for more similar articles. Keep up the good work, guys! Even Women Can Buy Viagra Online Today! Who would've thought that women with no erection problems can use and benefit from Viagra? Well, ask your doctor if he/she has ever written a Viagra prescription for a woman and you'd be surprised to hear the answer. Only those who buy cheap Viagra 100mg can save money by cutting the pills as needed and prescribed by a licensed doctor. The video is so informative and educational to ED patients who find the FDA rules silly and fragile for Rx meds.